We recently interviewed Gretchen Rubin for our blog. 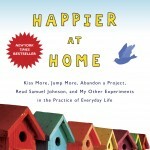 She is the best-selling author of The Happiness Project and, more recently, Happier at Home. We are thrilled she agreed to answer some questions for us. Her “real-world” advice and honestly is one of the many inspirations for our book. 1) The52weeks.com is all about how Pam and I spent a year trying to get better, going again, or just get over it! We didn’t always succeed and found that carving out time for yourself is hard even when you put your mind to it! We know it is critical though if you want to get “moving” again. Is there one thing you do when you feel “stuck” and need to get going again in any area of your life? Gretchen: I re-read my favorite books. It always re-charges my batteries. 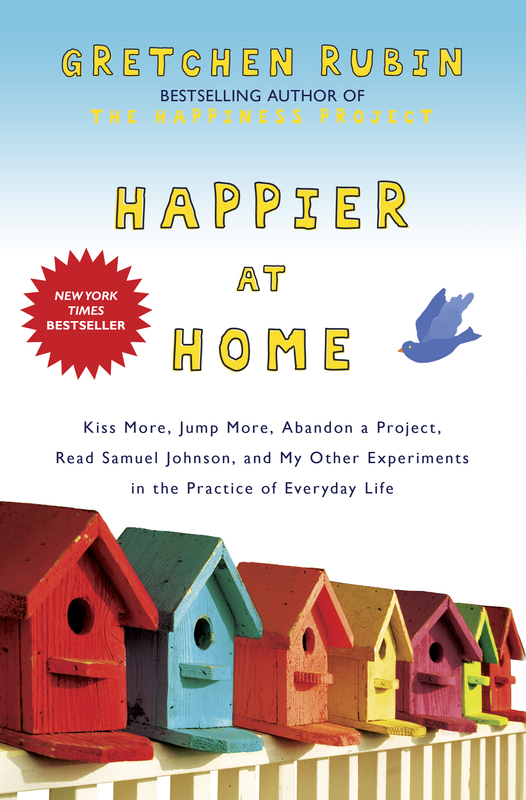 2) Your new book, Happier at Home, focuses on the importance of the home overall, gaining control of your environment among other things and hopefully, as a result, reaping the benefits of making home a better place on so many levels. What are your top 3 suggestions for your fans in terms of the home? For most people, outer order contributes to inner calm. It may seem like taking the time to clear closets, make your bed, clear counters, file, hang up clothes seems unimportant, but people really seem to feel both calmer and more energetic when they’re in a clearer environment. In Happier at Home, I talk about how I “cultivated shrines”—that is, I took the time to arrange my most meaningful possessions in a very deliberate way. Some people have shrines to France, to music, to arts and crafts, to family…by arranging these possessions in “shrines,” you can make them more engaging. 3) We tout the importance of baby steps, especially when change seems so overwhelming. In your opinion, what are some easy, small steps people can take to be “happier” in general? Get enough sleep! This is SO important. Turn out the light at a reasonable hour. Most people need 7 hours of sleep so do the math. Exercise, or at least go for a 20 minute walk each day. Exercise boosts energy, so if you’re dragging, exercise will help. Fight the “bad trance.” This is the time when you find yourself zoning out in front of the TV, the Internet, the fridge. Often it happens when you’re too tired to do something more demanding, that would also be more happiness-boosting. If you’re too tired to read a book and can only watch TV, go to sleep! 4) The New Year is fast approaching! What do you think of resolutions and what is your advice to readers about making even one change for the New Year? 5) We have a chapter in our forthcoming book that is all about getting “unstuck” specifically in relationships. You were quoted in an article and said, “The only person you (can) change is yourself and when you change, relationships change.” What exactly do you mean by that? When did you apply that philosophy and what has been the result in your relationships? We’d love to share that with our blog readers. Gretchen: I can’t change my husband, but when I’m more light-hearted, more considerate, more tender, he responds to that change. I can’t change my children, but when I’m more patient, more silly, and less rushed, my children respond to that change. It’s so tempting to think, “I’d be happier if other people behaved properly,” but you can’t assign resolutions to them! So whenever I want to see something different in my life, I always try to think of what change I could make. Gretchen: Do we develop more fears as we get older? I’m not sure I agree with that. But for me, it was a matter of deciding that I really wanted to tackle it, and was willing to accept the intense discomfort. 7) In your Real Simple magazine interview you listed “try something new” as one of the 9 things someone can do to be happier in 30 minutes! In a nutshell, why do you think it is important to try new things? What new thing(s) have you tried this year? 8) What is one small or large change you made this year to improve your health or change a bad habit? Gretchen: I’ve been an on-and-off “tracker” — writing down what I eat and keeping track. Now I’m back doing it. I think it really helps. 9) Can you share something with our readers they may not know about you? Gretchen: I’m a constant hair-twister!